The new service is called Molotov Together and is an interesting experience in many ways. I tried an early version of the service a couple of weeks ago. 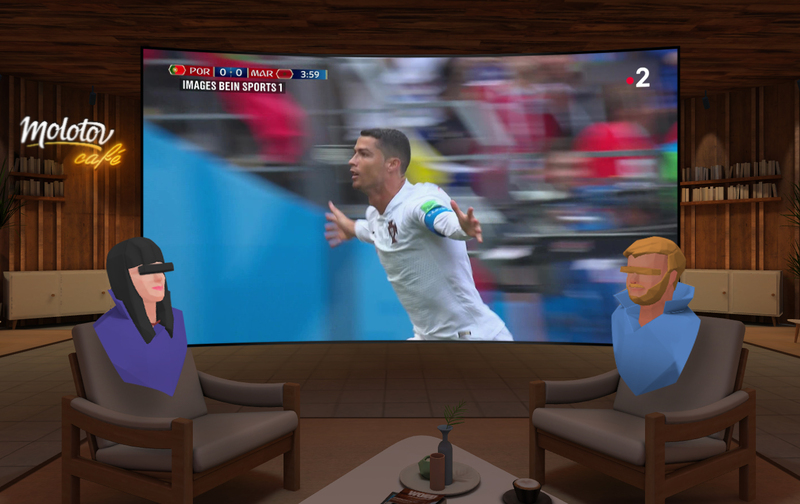 At first, I was quite reluctant about the idea of watching TV in a VR headset. I’m not a fan of VR in general, and many VR headsets already let you watch videos in in virtual reality. In many cases, you end up with a YouTube player in a web browser projected on a virtual wall in a virtual room. But Molotov is aware of that and knows that watching a video is still better on an actual TV. When Molotov co-founder and CEO Jean-David Blanc started pitching me the idea of Molotov Together, he first talked about live TV. In the era of Netflix shows and huge iTunes libraries, it’s hard to remember that watching TV used to mean watching something live, sharing a moment together. You can still experience this with football matches, election nights and other important events. And in those cases, the side conversations and jokes can be as important as the content itself. Molotov has created a virtual reality coffee shop called Molotov Café. With Molotov Together, you can invite one or two friends to watch TV with you in the café. You all sit in comfortable virtual reality armchairs and can see each other. Each person can control the TV channel they want to watch and access all Molotov content — in that experience, you don’t share a TV, everyone has its own TV. But Molotov Together truly shines when you’re all watching the same channel. After that, you can watch the same content and talk together using voice chat. You don’t have to press any button, you can just casually sit back and watch something together. I tried Molotov Together with Jean-David Blanc and I didn’t expect it to work so well. At first, entering the virtual coffee shop is a bit odd because it’s a significant context change. But once you start chatting with the other person and comment on what you see, it feels like you’re sitting next to each other. Long-distance friends and couples sometimes watch the same movie with Skype or FaceTime running on a device. Molotov wants to perfect this concept and people in this situation will love the service. Similarly, there’s a reason why people watch reaction videos to popular TV shows. Hearing jokes and comments on your favorite show is a good way to enhance your favorite content. A product like Molotov Together doesn’t work well if the team behind it isn’t paying attention to small details. I tried Molotov Together with an Oculus Go but the app should eventually work with all major VR headsets. Molotov Together is a multiplayer experience. Just like a video game, you need to see the same thing at the same time. If your favorite team scores a goal and your feed is five seconds behind, it’s not going to cut it. That’s why Molotov made sure that two persons stream from the same content delivery network so that the video feeds are perfectly in sync. While you can control the volume of your virtual TV, the voices of your friends are also spatialized. Even if both of your friends have a similar sounding voice, you know who is talking without even looking. Molotov Together will be released in February 2019. Any Molotov user will be able to access the service if they have a compatible VR headset. The company wants to release new features after that. In particular, Molotov will let you invite people to your own virtual living room and watch your TV. This time, the host controls the TV and can stream premium content — other people can watch premium content even if they are not subscribers. It’s going to be interesting to see the reaction of French regulators. Molotov currently has around 7 million users in France. Every day, 1.2 million users watch something on Molotov. They stream a total of 1.1 million hours of content. As you can see, those Molotov sessions can be quite long. With this new product, Molotov proves that it’s a technology company that competes with content companies. Molotov Together won’t change the face of the company. But the startup is still experimenting with new ways to watch TV. And that might be enough to give it an edge over its competitors.